There are some restaurants that are perfect spots for when the weather gets super cold. Bubby's in Tribeca is one of these spots that serves comfort food in a cozy setting that just makes you feel warm when you walk inside. The decor is very rustic and this location serves great food and drinks. On this particular day I was stopping by for some post work drinks and decided on a nice crisp glass of sauvignon blanc. I've mentioned this before, but I am starting to develop a real appreciation for sauvignon blanc. This particular glass is a Lex Hexagonales bottle from France. I typically only like sauvignon blanc from New Zealand so this was a pleasant surprise. It was earthy, crisp and super light which is perfect for a pre-dinner drink. 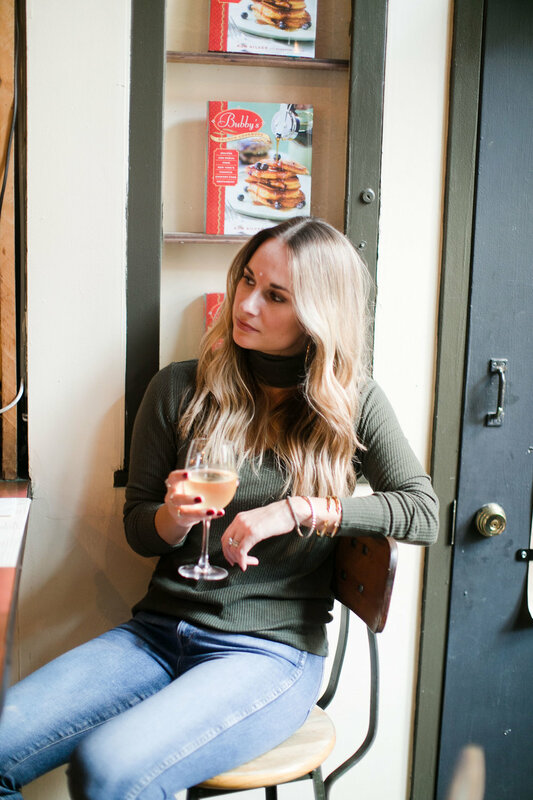 Since Bubby's is a casual spot, I wore my LNA detached turtleneck sweater with my frayed hem 3x1 jeans. This is a great top to transition from day to night. To shop the wine or my look, click the links above or below. It's hard to believe that Thanksgiving is only a week away. Although it is not my favorite holiday, I still really love any excuse to get my family together over some great food and wine. We always make a traditional turkey dinner which goes well with a lot of different wines depending on your taste. Most of my family are red wine lovers so I tend to serve up a nice hearty cabernet with the option of a lighter pinot noir. Below I have hand picked some of my favorites for some inspiration for your own Thanksgiving table! Impressively intense and focused, with vibrant Meyer lemon notes up front, followed by pineapple, green apple skin, dried apricot and green tea details, coming together on the smooth, spicy, juicy finish. A must for all sav blanc lovers! This dry white wine has a straw yellow color. Its clean, intense aroma and bone-dry taste (with an appealing flavor of Golden Delicious apples) make Santa Margherita’s Pinot Grigio a wine of great personality and versatility. This wine is a real crowd pleaser! Aromas of chalk, stone, light strawberry and lemon follow through to a full body and tangy acidity with plenty of flavor at the finish. Lively and delicious. This is hands down my favorite rosé! The Competitor is a Pinot Noir that drinks as smoothly as velvet, with succulent red fruit flavors, bright mineral notes and a delicious, pleasing finish that goes on and on. This is a win-win that pairs with everything from spicy food and fish courses to lightly grilled meats and red sauce-based dishes. Goes well with the hearty turkey! The Cabernet Sauvignon opens with aromas of black cherry, plum and violets, followed by subtle flavors of strawberry and allspice. Firm yet supple tannins finish off this approachable fruit-driven Cabernet Sauvignon, making it ideal for a variety of food pairings. A classic cab! This is one of my go-to bottles! This medium bodied Cabernet exhibits notes of plum, cherry and dark chocolate. This bottle is on the pricier side, but perfect for a holiday or special occasion. There is nothing like the perfect weekend day where you have nothing to do but walk around your city and sample some of the food and drinks it has to offer. I talk about this a lot, but one of my favorite things to do is walk around NYC without an agenda and pop into new spots that I've never tried before. L'Angolo is an Italian restaurant located in Tribeca right on one of my favorite streets. It recently opened so I figured I would stop by and check out the wine menu and enjoy the people watching outside. The wine list is very extensive and had one of my favorite bottles of pinot grigio on the menu, Santa Margherita . This wine is perfect with a light meal or a cheese plate! Today I was meeting up with some friends after work so I wore my rose gold House of CB bomber, paige jeans and classic Vans. 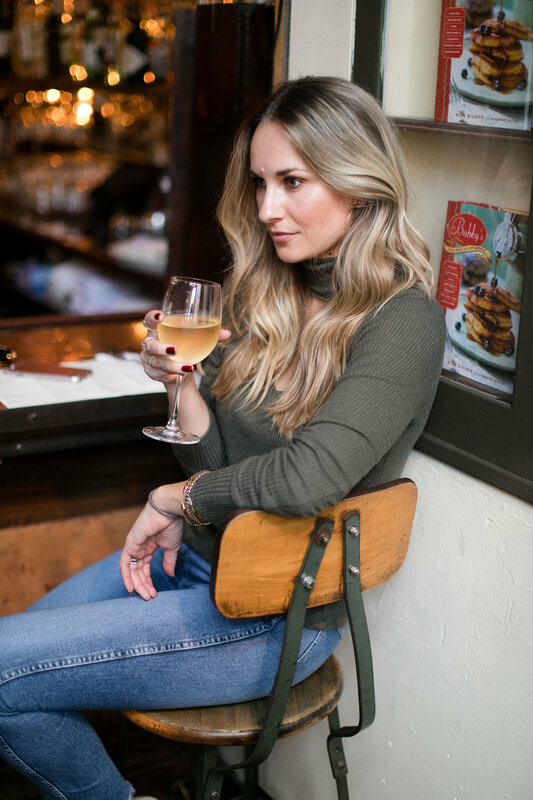 To shop my look, or the wine, click on the links above and below! This is one of my favorite bottles of pinot grigio! It is super crisp and pairs perfectly with a nice cheese plate. It has a nice fruity aftertaste with a dryer finish. A must have for your wine collection! I cannot believe it is mid-October and we can still comfortably dine outside in NYC! 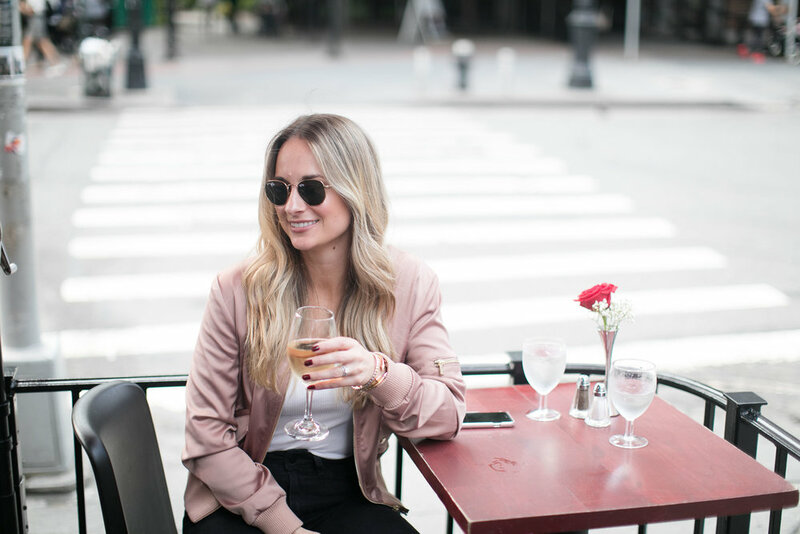 The weather this fall has been so warm and I have been taking advantage of it while it lasts by trying out some new spots for a glass of wine and people watching on the sidewalk! Today I checked out a tiny restaurant in Tribeca called Smith & Mills. This place is super cozy with an intimate vibe. The decor makes you feel like you are in a hidden bunker located right in the middle of the city. While there I sipped a new rosé wine that I have never had before, Moulin De Gassac Guilhem Rosé, 2014. 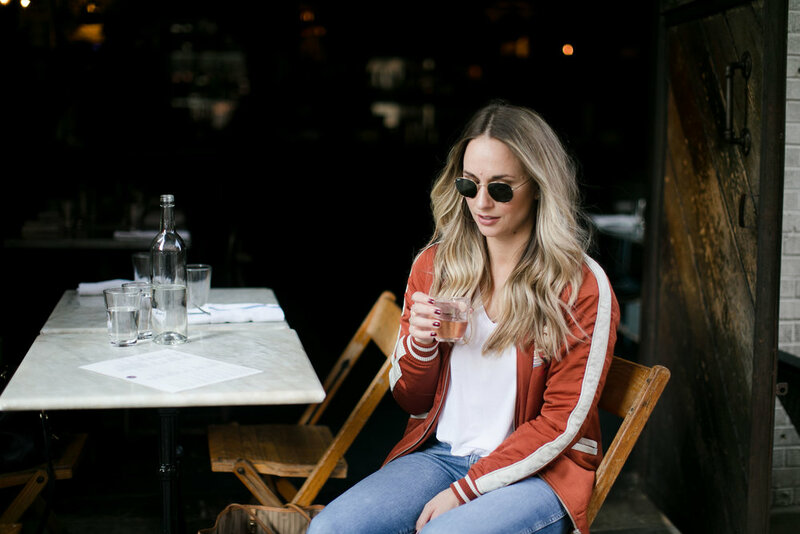 The wine tasted amazing and the whole vibe was the perfect match for my sporty bomber jacket, frayed jeans and booties. The perfect fall look! 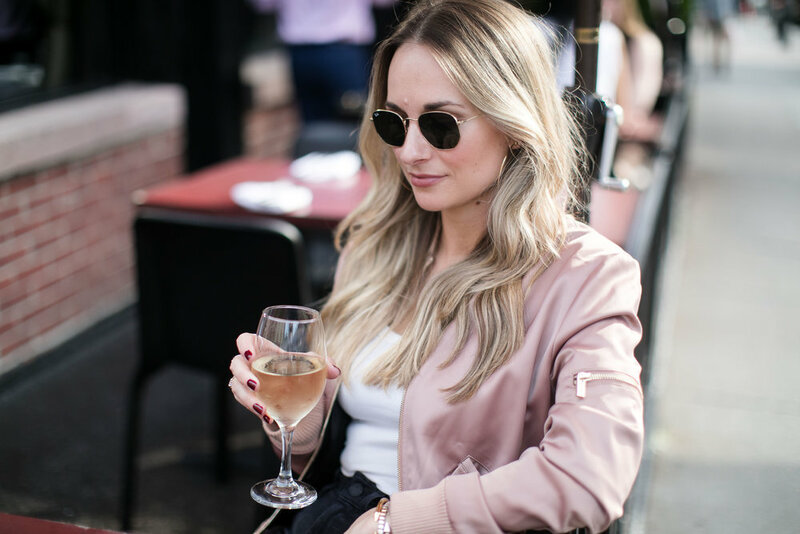 To shop the wine or my outfit, click the links above and below! Lively, vivid rose pink with some salmon glints. ￼ Pleasant, intense, floral and mineral on the nose with a well balanced freshness combining red currants and berries. This rosé was the perfect balance between refreshing and slightly dry. Floral with a smooth finish. If you like rosé, you will like this wine!